We renovate and enhance Land Rover Defenders at our Lichfield, Staffordshire depot. Full rebuilds, servicing, upgrades, renovation, parts replacement and enhancement. If you have vehicle that you would like us to work on, give us a call on 01543-254507. 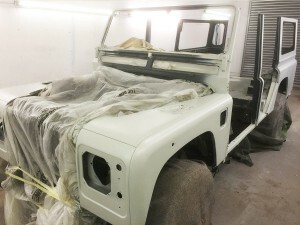 The photo on the right is a recent Defender renovation project, a 110 CSW 200Tdi 1990 (now sold). SEE what it looks like after we finished it HERE.